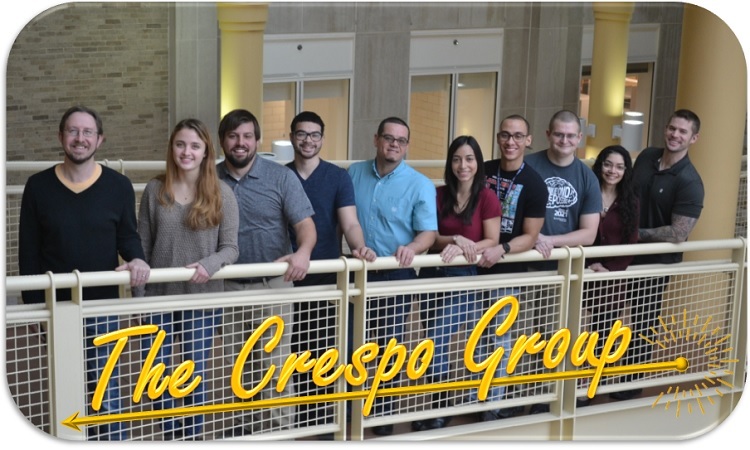 Welcome to the Crespo Group Page! Research in Professor Crespo's group focuses on reaction processes of relevance to biology, renewal energy, and to the environment, with the chief aim of understanding their mechanistic aspects at the molecular level. Our group combine advanced photochemical techniques, steady-state and time-resolved spectroscopy, and computational methods to produce specific knowledge about the nuclear and electronic factors controlling the photochemistry of these molecules. The research endeavors in Prof. Crespo's group is cross-disciplinary and covers diverse areas of chemistry, exposing undergraduate and graduate students and postdoctoral associates to cutting edge research and state-of-the-art technologies. These research experiences contribute towards their integration into mainstream scientific activities. Students involved in these scientific activities acquire expertise on a wide variety of analytical and spectroscopic techniques, and on time-resolved instrumentation with femtosecond, picosecond, and nanosecond time resolution. Opportunities exist for complementing experimental work with molecular dynamics simulation and high-level quantum chemical calculations. Research Interests: Ultrafast Spectroscopy, Biophysics, Organic Photochemistry and Photophysics, Light-Harvesting and Energy Conversion, Computational Chemistry, Chemical Dynamics and Kinetics. Funding: ACS-PRF, DoD, and NSF. Find us on Facebook, on Twitter at @CrespoGroup, and on LinkedIn at The Crespo Group.